Speaking to ‘Daily News Business’ he said that this move will be a major boost for tourism and the Prime Minister is working on this matter. Sri Lanka offers ‘on arrival visa’ only to Singapore, Nepal and the Maldives at present. Earlier, the island provided on arrival visa to many other countries, similar to the policy introduced by Singapore. However, that decision was halted eight years ago. Visa free arrival is now offered only to visitors from Singapore, Nepal and the Maldives and these countries also offer on arrival visas to Sri Lankans. 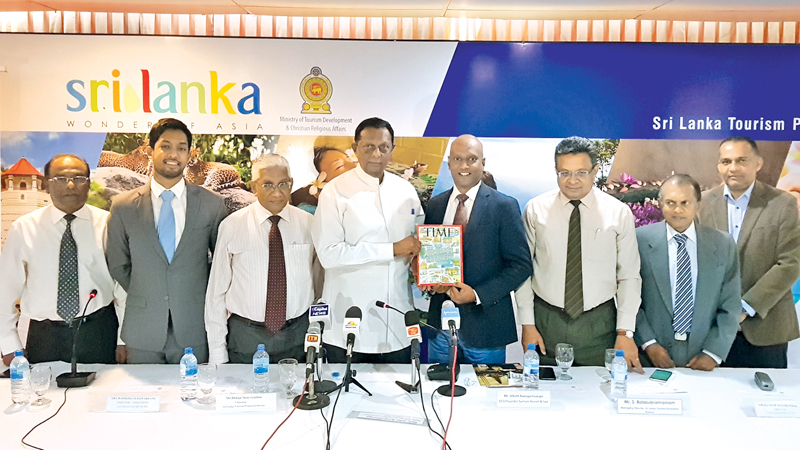 Explaining the latest initiatives to increase the number of tourists to the island, Amaratunge said the Palali airport would also be opened to Indian airlines in a bid to woo more travellers to visit Jaffna and then move out to other areas. “We are looking at inviting smaller aircraft less than 100 passengers each from India to use the Jaffna Airport which will be upgraded to meet international standards.” A joint investment of over Rs 1.2 billion from both India and Sri Lanka will be made for this soon. The Minister said that the domestic airline taxes too would be reduced soon to enable scheduled domestic operations to take place from Jaffna to other domestic airports in Sri Lanka. Sri Lanka tourism will also talk to the Minister of Civil Aviation in a bid to offer better prices for ground handling and fuel at the Colombo international airport. Minister said that they will also request SriLankan airlines to reconsider some of their ‘overpriced’ fares to region including Bangladesh. Minister Amaratunge added, the Ministry of Tourism has requested the Finance Ministry to formulate a mechanism to charge tax from some of the online operators like Airbnb who sell local rooms including apartments for foreigners and take the income overseas while local hostellers pay high taxes. Minister Amaratunga noted that the successful promotion on CNN and the planned branding and marketing campaign in November will bring more high-end visitors to Sri Lanka. “We are also on the verge of launching several campaigns in markets with high potential, and we are grateful that a Sri Lankan property ws selected to this prestigious list and put Sri Lanka on the world map”. Ministry of Tourism has decided to once again implement the Minimum Room Rate (MRR) regulation for Colombo City Hotels due to surge of demand from high end hotels said Minister of Tourism and Christian Affairs, John Amaratunge.